The Valley of Elah is one of the latest in a line of films about Iraq and the war there. The Valley of Elah was the location of the battle between David and Goliath in the war between the Philistines and Israelis- the title gives a clue to the real subject of the film. At one point in the film the main character, the father of a US soldier, investigating his son's murder, tells a young boy the story of David and Goliath and tells him that the moral of the story is that you should go down into the valley of Elah, get close to whatever scares you, the Goliaths of your life, and aim your slingshot right at them the moment before they are about to kill you. You have to confront life and take the utmost risks and in that moment you become a hero, its implied that in that moment you become a man. The father, Hank Deerfield, is an ex serviceman, ex military policeman whose son seems to have taken his advice, gone to Bosnia and then Iraq and confronted evil. The question that the film poses is what happened to him. What it reinforces rightly is an important lesson in a society which is largely demilitarised: that war changes people and can often deform or reform them. The soldiers that we are shown coming back from Iraq are definitely altered by their experience. Driven to seek out cheap thrills whether drugs or strippers, in order to find relief from dreams of horror in the desert. Life around barracks in America is shown as depressing: soldiers struggling from drink to drink, men getting into the army who are basically criminals before they start, the experience of war turning others into criminals- the horrors of Iraq and the ways that it justifiably empties soldiers of trust for others and turns them from normal young men into killing machines whose first response is to go for their knives. 'Doc' the son of Hank, a young man we are led to believe of impecable character before he went to war, gets his name 'Doc' from the particular way that he mocks Iraqi prisoners when they are arrested. The contrast between military and civilian worlds is deeply embedded in this film. There are moments when the ordinary police come up against the fact that not having fought, they do not understand the mindset of soldiers. Furthermore all the way through Hank uses his intuition as an ex-soldier to argue about who might have killed his son: he too is willing to deal in violence whenever he suspects. The whole film is filled with a confrontational atmosphere: people don't talk, when they disagree, they shout and scream. All the aspects of life here seem disfunctional: the police department is riven with sexism and favouritism, producing macho posturing and screaming rows. Everyone lives at a high level of tension- everyone lives on the edge of their emotions. 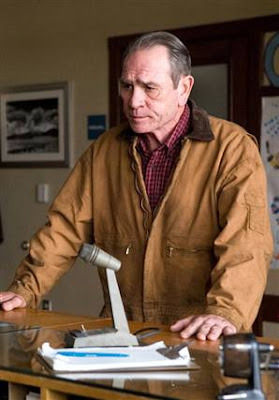 Tommy Lee Jones's performance as Hank is particularly impressive because his face reveals in its wrinkles all the emotions he has to contain in order not to scream out loud in pain and anger. But the film needs to go further. The ending is trite- we suddenly have a solution through a confession but we never get inside the heads of those that commit the murder: however important it is to understand the way that soldiers are changed, we don't see enough of what propels people into the army. We never understand these soldiers' earlier lives and consequently we don't know to what extent what they become is innate within them. The film could have been stronger by giving us more detail about them. Furthermore there are too many longeurs here: what I'm sure the film makers intended to create tension, little dialogue and lots of moody music, merely irritates. It doesn't create atmosphere, but slows the film down. A two hour film is a good effort, but could have been more powerful if reduced to one and a half hours instead. Moody music is also no substitute for scenes that often have only two lines of dialogue- and more often than not, scenes are missing. It would have been interesting to see a scene for instance in which the soldiers being interviewed by the police lied, interesting to see their reactions and their ways of expressing their lies. Afterall the way that soldiers react to coming back from Iraq is the core of this film: and that's what we are missing. Having said all of that, the performances are strong and there is a point to this movie. The point comes back round to Hank Deerfield's speech about the valley of Elah: the film is all about the effects of confrontation. Hank's son goes down into the Valley of Elah with his comrades and he is changed by the experience: changed into a bitter and deformed young man, crippled mentally, sent to drugs and prostitutes by the experience. All his comrades too are vividly effected by the experience: reliving it. There is one wonderful moment when a soldier tells Hank that when in Iraq he hated it, but two weeks after getting back there is nowhere else he would rather be. The truth of this concept is reflected in most studies of what happens to soldiers after any war when they come back (one of my problems with this film is that it presumes that this is true only of Iraq: it isn't, plenty of young men were changed by World War One and Two). The film dwells on this idea though and it repeats it again and again: most evocatively in the way that Hank who knew and brought up his son, confronts the contents of his son's mobile phone, filled with videos of the torture of Iraqis and the tragedy of war. But there is another valley of Elah here- and that is the investigation itself. Hank confronts the very issue of his son's death, the very fact of his murder and the existance of his corpse. Again the experience changes him. There is no question in my mind that Hank is deeply disturbed by his experiences, he lashes out often against those around him. But he also is humiliated by the truths that he finds out, he is blamed by his wife for his sons' deaths and he finds himself stymied at every turn by bureacracy. Ultimately the story is as much about his descent into the valley, his confrontation with the monster, the Goliath of his son's murder and what he gains from it and how he changes from it. The problem is that his gain might be negative, his change might be to the worse- the truth is hard to confront sometimes and the verdict delivered by Hank on life is not a positive one. Its a message that sits uneasily with the film's aim which is to bring America itself to its own valley of Elah, to its own confrontation with the Goliath of what it has done in Iraq to its young men. The message is pacifist. But its also strangely a message for complacency- don't look too hard, don't confront too much because what you will find will disturb and upset and disorientate you. The film doesn't really raise sympathy for the soldiers because we know too little about them, it does create sympathy for the father but it shows the process of investigation as a futile one. It embodies exactly the nihilism that the soldiers have coming back from Iraq: in that sense this film is very much the product of its times- rather than being a post Iraq film, it is a film that is founded amidst realities shaped by Iraq. It is interesting, it is a cinematic failure, its worth seeing but it is also deeply problematic. After many blogs, I feel I've nibbled morsels and even hors d'oeuvres, amongst the better ones. But with you, Tiberius, we have the main course, complete with a heavy Chateau Neuf du Papes.